Central cavity of brainstem show different characteristics and names at different level. At lower end of medulla it is a narrow canal continuous below with central canal of spinal cord. At the level of pons and upper half of medulla oblongata, it becomes wide to form the cavity of 4th ventricle of brain. At the level of midbrain it is a narrow slit called aqueduct of Sylvius. In alar plate: From medial to lateral in closed part of brainstem, i.e. midbrain and lower end of medulla oblongata and, from lateral to medial in open part, i.e. pons and upper part of medulla oblongata. Ultimately, neurons of all these columns will persist in some level and disappear in some level. So they will no longer be present in the form of continuous cell column althrough. These cell groups will form different motor and sensory nuclei of 3rd to 12th (last 10) cranial nerves. Migration of neurons of alar lamina: Apart from formation of sensory (afferent) nuclei of cranial nerves, neurons of alar plate will migrate from its original position either ventrally or further dorsally to form some other named nuclei in different level of brainstem (described below). This nuclei, as migrated, will intermingle with the components (white matter) of marginal zone. Vertical: These are either ascending (afferent) or descending (efferent) tracts of nerve fibers connecting spinal cord with various higher centers. 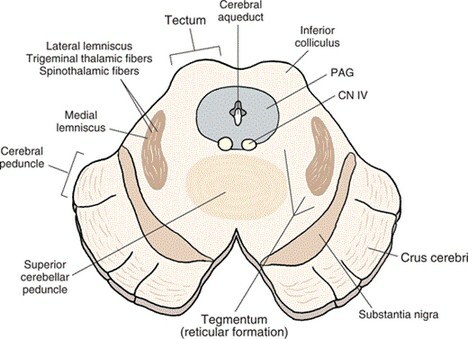 Horizontal: These are fiber bundles connecting various centers of central nervous system with cerebellum in both direction, passing through 3 cerebellar peduncles. Migration of cells of alar plate to form various nuclei: As already stated, neurons of alar plate form various sensory neclei of last 10 pairs (3rd–12th) of cranial nerves. Besides, neurons from alar plate migrate either ventrally or further dorsally to form various nuclei in different levels of brainstem as follows. At the level of lower closed part of medulla oblongata: Cells of alar plate migrate further dorsally on either side of posterior median sulcus to form two nuclei.